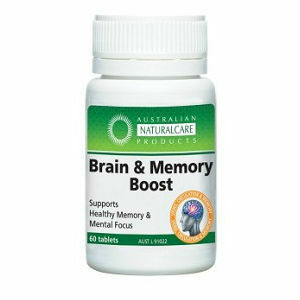 This is a review of the supplement Australian NaturalCare Brain & Memory Boost. This product contains ingredients that help to increase concentration, mental alertness, cognitive function, and memory. It can also reduce stress, anxiety, and nervous tension. You will learn more about the suitability of this product as you read further. You should take 2 tablets in a day. You can also take this product according to the prescription of a health care practitioner. You should consult a health care professional in case symptoms persist even after taking the supplement. One bottle containing 60 tablets costs $18.5 on the company’s website. This is a relatively low price compared to the cost other products in the market. A low price may be a possible barrier for potential users who believe that a low price signifies low quality or low potency. The manufacturer of this product offers a 100 percent satisfaction guarantee. You have to return the product within sixty days from the purchase date to take advantage of this guarantee. This guarantee proves to users that this is a reliable and high-quality product. We did not find any reviews from customers who have used this product. The lack of such reviews may be a concern for new customers who want evidence of the product’s success. You can trust this product to increase your memory, cognitive function, focus, and alertness. You can also trust it to reduce stress, nervous tension, and anxiety. It is an ideal product for different types of consumers including the elderly, professionals, and students. The use of a strong concentration of two trusted ingredients (Ginkgo biloba and Bacopa monnieri) is a major reason to trust this product. Furthermore, the fact that the manufacturer provides a satisfaction guarantee gives new users another reason to purchase this product without worrying about the value of their money. In spite of the aforementioned positive sides of this product, there are several reasons why having confidence in this product might be a problem to potential customers and customers who have just started using the product. First, the manufacturer has not given any information about the possible side effects that might result from consuming the tablets. Secondly, the manufacturer provides the product at a low price, which can cause quality concerns among first-time users. Users may question the quality of the ingredients used to produce the product because of the low price. Thirdly, it is somewhat concerning that there are no customer reviews to show that those who have used the product have experienced the claimed benefits. Nevertheless, the positive aspects of this product provide enough of a reason why you should purchase and try this product to boost your memory and brain. Henry Costa	reviewed Australian NaturalCare Brain & Memory Boost	on June 29th	 and gave it a rating of 3.5.